If you‘ve got it, flaunt it - the oversize jaw size of the KFW clevis foundry hook plays all the tricks. 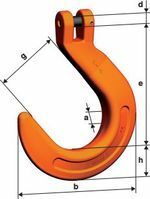 This hook is frequently used in foundries and is manufactured according to EN 1677‑1 with the mechanical values of G10. Other classic pewag quality features include BG-approval and CE-marking. Yet another typical pewag feature – the clevis system means that linking the hook to the chain is quick and easy, without the need for a connecting element. A full operating manual outlines everything you need to know for efficient and safe handling. Please note that the hook is suitable for straight pull only and that the load must not be placed on the hook tip. Please check whether use without the safety catch is admissible prior to each use. For a competent person, assembly of the clevis foundry hook is quick and easy and does not require any special tools. Spare parts for the coupling pin and retaining pin are easily procured, thanks to the designated spare parts set.